Shannon Frey began her geology studies at the University of Alberta in 2002 and was awarded her B.Sc in 2007. She conducted her honours thesis with Dr. Murray Gingras, and investigated the mechanisms and morphologies of fluid escape structures in a laboratory setting. The study concluded that many possible structures in the rock record identified as water escape structures could possibly be attributed to fluidized gas escape. She has been employed as a geochemistry lab assistant at the University of Alberta, working to conduct chlorine isotope analysis of fluid inclusions. She has also conducted two work terms in the Oil and Gas industry in Calgary. In 2006 she completed a study of the Basal Belly River formation for ConocoPhillips Canada, and in 2007 she studied the carbonate Wabamun formation for BP Canada Energy. She has conducted fieldwork in the Rocky Mountains of British Columbia and Alberta, the foothills of Alberta, and the Ogeechee river estuary in Georgia. In January of 2008 she moved to Vancouver to begin her M.Sc at Simon Fraser University with Dr. Shahin Dashtgard. The goal of this study is to quantitatively determine relationships between sedimentology, ichnology, and hydraulic energy for beaches developed along a relatively straight coastline. 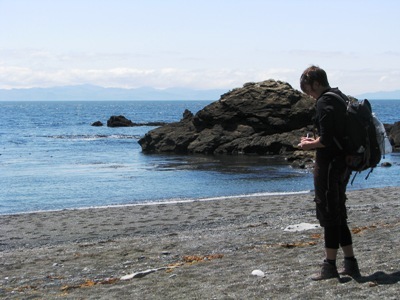 The southwest coast of Vancouver Island (along the Juan de Fuca strait) is relatively protected from open ocean swells, with well-developed sand- and gravel-dominated beaches. Given the similarity of hydraulic energy along the coastline, it is possible to assess changes in depositional character of the beaches deposited along it. French beach, China beach, and Sombrio beach will be studied to compare their ichnological, and sedimentological character. Hydraulic energy data (wave height, tidal currents, alongshore transport) will be collected with Doppler current meters. Sediment sources and alongshore drift directions will also be established for the study area. The subtidal components of the beaches will also be studied, to be sampled using SCUBA techniques. Theoretically, relationships determined from this study can be used as a means of predicting along-strike variability of beach sediments preserved in the rock record.